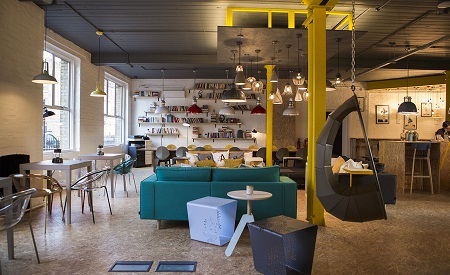 Over the past few years, London has emerged as the world’s capital of co-working. The five-year trend shows that 900,000 square feet of co-working spare (approximately 8 per cent of all new office space in London) are added or taken up in the city every year. Currently, it is estimated that London is home to 156 co-working spaces, and this figure is expected to grow exponentially in the coming years in a reflection of the how quickly the sharing economy gaining traction all over the business world. Co-working space in London is not only the office accommodation of choice for start-ups, remote workers or freelancers, but it also appeals to large companies and corporates based in the City. KPGM, Microsoft, HSBC, Cisco, and Menlo Innovation are some of the blue-chip firms that currently use co-working space in the city. Whether they are one-person start-ups or large corporates, co-working space occupiers are often attracted by the perks that this type of accommodation offers. These go beyond a strong entrepreneurial and collaborative spirit and a working environment specifically designed to foster creativity, and include flexibility, all-round support, spaces that foster a healthy work-life balance, and a strong sense of community. In co-working spaces, flexibility is not only evident in the terms of rental agreements, but also in space distribution, as some of these offices are arranged in open plan but also provide private working areas in work pods, or dedicated Skype booths used to conduct private meetings online. And lately, some co-working offices have even implemented a pet-friendly policy. Co-working spaces are known for providing opportunities to take a break and disconnect from the intense burden of creative or tech work and for make work-life balance a priority. The top spaces have dedicated rooms equipped with ping pong, foosball, or pool tables, and some even offer a putting lawn, indoor gardens, yoga lessons, or hackathons. Many go beyond offering a fully equipped kitchen and free food and drink and instead go for gourmet catering. Tenants at WeWork Paddington get to enjoy Prosecco on tap, and members of Work.Life enjoy perks like free breakfast on Mondays or pizza nights. A strong sense of community is highly valued by many young professionals who increasingly look for workspaces they can identify with. In some co-working spaces, community building is enacted through networking events and sports leagues. In others (such as at Rainmaking Loft) tenants are invited to purpose-built meet-ups or regular “inspiration hour” talks. Other top perks are more work or career-oriented, and include events like seminars, access to formal and informal mentoring, invitations to exclusive product launches, sessions with angel investors, and opportunities to meet decision-makers from the city’s top companies. Lastly, the introduction of shared living and working spaces (such as those proposed by The Trampery) is a perk that is quickly gaining traction, since this is not only a practical benefit that makes commuting redundant, but also has a social aspect that contributes to creating a sense of community beyond the workplace.